Born in Bavaria, 1898. At 24, his cutting-edge Drums in the Night won him Expressionist recognition. His quickly written Threepenny Opera was Germany’s greatest hit of the 1920s. 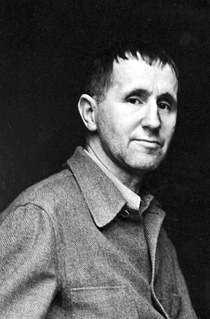 Revolutionary in form for 1928 Berlin – non-operatic, anti- highbrow musical theater – and cynically satirical, it irritated the Nazis; Brecht let Germany with his family in 1933. He continued to write in Scandinavia (e.g. Mother Courage) until the Nazi invasion. In California, along with some work for Hollywood he wrote The Caucasian Chalk Circle and Galileo, produced in L.A. in 1947. The House Un-American Activities Committee interrogated him that same year; he left the U.S. the following day. He established the Berliner Ensemble in 1949 in East Berlin, opening Mother Courage with his wife Helene Weigel; its 1954 tour to Paris brought him recognition as Europe’s most important director, a year before his untimely illness and death.